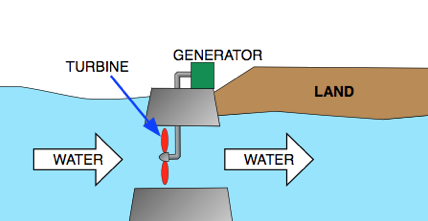 Water can be used to drive barrierdamelectricalgeneratorskineticseatidestransferredturbineswater directly. The water in the barrierdamelectricalgeneratorskineticseatidestransferredturbineswater rises and falls because of waves on the surface. Wave machines use the barrierdamelectricalgeneratorskineticseatidestransferredturbineswater energy in this movement to drive electrical generators. Huge amounts of water move in and out of river mouths each day because of the barrierdamelectricalgeneratorskineticseatidestransferredturbineswater . A tidal barrage is a barrierdamelectricalgeneratorskineticseatidestransferredturbineswater built over a river estuary to make use of the kinetic energy in the moving water. The barrage contains electricity barrierdamelectricalgeneratorskineticseatidestransferredturbineswater , which are driven by the water rushing through tubes in the barrage. 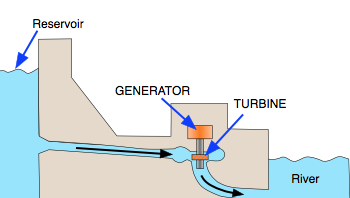 Hydroelectric power stations use the kinetic energy in moving barrierdamelectricalgeneratorskineticseatidestransferredturbineswater . Often, the water comes from behind a dam built across a river valley. The water high up behind the barrierdamelectricalgeneratorskineticseatidestransferredturbineswater contains gravitational potential energy. 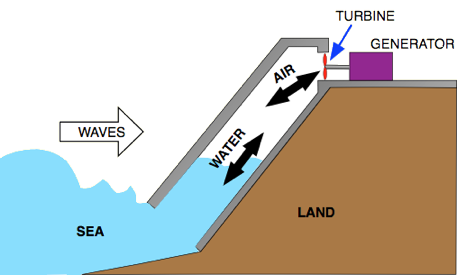 This is barrierdamelectricalgeneratorskineticseatidestransferredturbineswater to kinetic energy as the water rushes down through tubes inside the dam. The moving water drives barrierdamelectricalgeneratorskineticseatidestransferredturbineswater generators.